DIY Income Investor: Luck or Judgement? Man or Monkey? The end of the calendar and financial years are times to take stock, as the financial markets are structured around these dates and a lot of analysis takes place about what worked (or didn't). But when your investment strategy does well - or badly - there is always a question to ask: was it just luck or is it a result of judgement (good or bad)? And how good is your judgement anyway? It has been said that the way we think (sometime illogically) is partially due to the remnants of our ancient 'chimp brain', which provides much of the emotional and instinctive wiring to our thought processes. 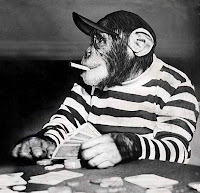 So, was the portfolio due to the man or the monkey? Champion or chimp? The excellent performance of the DIY Income Investor portfolio continues, with a dizzying 29% total return in the 2012/13 financial year (after tax - but then I don't pay a lot of tax). However, this is down from the 33% return achieved in calendar year 2012 - the gain in the first quarter of 2013 was only (!) 5% compared with 9% in the first quarter of 2012. I'm guessing that, overall, this must be a quite unusual result. No doubt some other Lucky Fools have done better - but not many! But how unusual is this return amongst other investors - and how much of this is down to luck (as a Lucky Fool) or the decisions of the man/monkey brain? As readers will know, this is a real portfolio, described in detail on the 'Portfolio' page of this blog, with key changes reported as they happen. For the stock market investments (as opposed to the purely cash savings accounts, which are not included in this result) I track the total returns each month (i.e. changes due to the price of the security plus any income received), and deduct any new investment. Some of these securities consist of Exchange Traded Funds in international dividend shares and fixed-income securities, bought at the beginning of 2013 in an attempt to diversify away from Stirling. So, there have been big returns for dividend shares, particularly in the UK (which is a core holding in the portfolio) and Asia/Pacific but a poor showing in Euroland and a loss in Emerging Markets (generally these losses were made in 2012, before I bought these ETFs). The FTSE 250 has performed particularly well but it makes up a small part of my portfolio. Fixed-income securities have not performed that well, under-performing the FTSE 100 in total returns. So, none of the benchmarks (apart from the FTSE 250) have achieved anything close to 29% total return: so what is it specifically about the DIY Income Investor portfolio that has worked in the last 12 months? 1. Although I have been trying to diversify recently, the portfolio is still primarily UK-based, and the UK has at least avoided the Euro currency storm and the US election and ‘fiscal cliff’. 2. I made a conscious decision during 2011 to increase the share of fixed-income to 50% of my portfolio. I have bought ‘distressed’ high-yield fixed-income securities significantly below par - and these have benefited from a change in market sentiment, yielding significant capital gains which have been reinvested. 3. The portfolio is overweight in the financial and insurance sectors - both of which were heavily hit by the global financial crash but continue to recover. 4. My ‘legacy shares’ - notably LLOY, RBS and BARC have recovered significantly during the year (although remaining far below their purchase prices). 5. Many of the UK dividend shares held are international in character and have therefore been a buffer against the fall in value of Sterling. So this good result must be due to the specific choice of asset classes and also no doubt some lucky choices of individual securities. And where does this point us to for the coming year? As many commentators have noted, this may be a turning point, with a bull run on shares - particularly in the US - seeming likely. Uncertainties about the Euro seem set to continue well into 2015, and Sterling continues to look shaky as the UK government seems politically incapable of cutting over-spending and in parallel seems unable to kick-start the economy. One telling sign: in the latest UK budget it seems that most families appeared to end up being better off! Not an encouraging sign for a country that is over-spending. This UK/Euro uncertainty may well result in some more QE, supporting inflated fixed-income yields for some time. I do not think that this outstanding portfolio performance is sustainable in the longer term - the continuing difficult economic times in the UK may mean a slide in the portfolio’s value in the coming months and years. And it is increasingly clear that the portfolio is not yet really as diversified geographically and sector-wise as it perhaps should be. So, what does the man/monkey brain say for the next 12 months? Update 4/4/13: Monkeys 'make better trades than the average fund manager' - you always knew it was true... (Original paper downloadable here). I thought UK currency was STERLING. Stirling is a town in Scotland. That must be the chimp brain at work!